Diuretics are the drugs which cause a net loss of Na+ and water in urine. However Na+ balance is soon restored, even with continuing diuretic action, by the compensatory homeostatic mechanism of the body, albeit with a certain degree of persisting Na+ deficit and reduction in extracellular fluid volume. 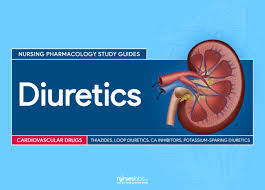 Diuretics are among the most prescribed drugs. Application of diuretics in the management of hypertension has outstripped their use in edema.